Samsung ML-1450 has a low purchase cost and is best suited to work for a small office. It is 14.3 inches wide, 16.1 inches deep and 11.6 inches high. The printer is controlled by four lights and three buttons. Samsung ML-1450 has a 550-sheet paper input tray but an optional 550-sheet tray can be put underneath the main slot. The multipurpose tray can carry up to 100 pages, 10 envelopes, 20 transparencies and 25 labels. This makes its capacity to 1,2000 sheets in total. The ML-1450 supports both USB and parallel ports and an optional Ethernet 10/100 BaseTx network adapter could also be purchased along with it. The printer is guaranteed to print at the rate of 15 pages per minute and when it prints combined text and graphics, it can print at a speed of 9.5 pages in a minute. The replacement Samsung ML-1450 Toner Cartridges have a page yield of 6,000 pages. 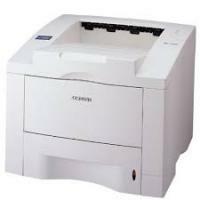 Samsung ML-1450 has a low purchase cost and great quality of printouts. It has excellent paper-handling and network-support capabilities. It is compatible with a large number of operating systems and supports both USB and parallel ports. It can handle watermarks, overlays, and posters and can handle a wide variety of media. The starter Samsung ML-1450 Toner Cartridges have a page yield of 3,000 pages. But it has slow printing speed and lacks in appearance and style. How to install the Toner Cartridges in the Samsung ML-1450 printer? Note: When you print a text at 5% of coverage, you can expect a toner cartridge to print approximately about 6,000 pages or more depending on the usage of ink for printing. Printing black and white documents usually consumes less ink and work for long. How to resolve the print quality defects of Samsung ML-1450 printer? Q. What cautions should be taken while handling Samsung ML-1450 Toner Cartridges during installation? Do not use sharp objects to tear the plastic of packed cartridges. As it may cause damage to drum of the toner cartridges. Do not expose toner cartridges in sunlight. If toner gets on your clothing, wipe with a dry cloth and, use cold water. Make sure no to wash it with the hot water as it sets toner into the fabric. After the toner cartridges is installed, make sure that the cover is closed properly. Q. I have recently installed Samsung ML-1450 toner cartridges, but why I am unable to print? Check for the power cord and power source. Is your printer set as a default printer? Have you installed toner cartridges properly? Check for the cable which is connected between computer and printer. Check whether you have configured the printer correctly. Q. Every time I take a print, my paper gets jammed in the printer? Too many papers loaded in the Samsung ML-1450 printer. The paper type may not be compatible with the printer. This printer is suitable for A4 size print out. Presence of any external foreign particle inside the printer. Q. When I print any document, it comes out blank. What are the possible reasons for blank print out? The document may contain blank pages. Check for the compatibility of Samsung ML-1450 Toner Cartridges with the printer. Check for any hardware defect such as damage in controller or board or in the roller. Check whether you have removed the sealing tape from the cartridges during installation. Q. Why there are black vertical lines on my printout. Initially, it was light but now with each printing, it is getting much darker. A. Black vertical lines are due to the scratch in the photosensitive drum in Samsung ML-1450 Toner Cartridges. You need to install the new toner cartridges. Q. How is the print quality of the Samsung ML-1450? A. Samsung ML-1450 printers produce good quality printouts that satisfied the user after every use. These printers produce sharp texts and can print up to a resolution of 1,200 x 1,200 effective dpi. Q. Will I receive a pack of Samsung ML-1450 toner cartridges when I buy the printer or will I have to buy it separately? A. No, you do not have to buy the toner cartridge separately. You will receive a pack of starter toner cartridges when you buy a new printer, that is meant specifically for the installation of the printer. After the toner cartridge runs out of ink, you can buy more cartridges from our website. Q. What is the difference between your compatible Samsung ML-1450 toner cartridges and the original toner cartridges? A. The difference between original and our compatible toner cartridges is that, original ones are made by the printer manufacturing company, whereas compatible toner cartridges are manufactured by a third party company to work with your printer. Also, compatible ink cartridges are cheaper as compared to original ink cartridges while producing the same quality printouts. A. You can use the CD-ROM that you received with your printer to install the software on your Windows or Mac OS computer. If you no longer have the CD-ROM, you can download the drivers for your computer from here. Q. What should I do if a faulty Samsung ML-1450 toner cartridge is delivered to me? A. In case an item delivered to you is faulty, please contact us on 048 30833221 or email us on info@printerinkcartridges.ie regarding the issue within 30 days from receiving your product. Just have your order details and invoice number ready and we will guide you through the whole process. Q. I got a call from someone claiming that they are from Printer Ink Cartridges and they want me to share my personal information with them. Should I do so? A. Well, we may do so by asking you for the following information like name, contact info. including email address, demographic information such as postal address and postcode, payment details. We do so in order to provide you with the best possible service, product delivery, and customer service. We may send information on the latest products or special offers. For all this, we may contact you by email or phone. Q. How many pages can I expect to get using Samsung ML-1450 Toner Cartridges? A. The expected volume of pages using the compatible ink is 5,400 pages. Q. Where can I check my order for the Samsung ML-1450 Toner Cartridges on this site? A. To check the order you can visit our Orders and Return page. https://printerinkcartridges.ie/sales/guest/form/ and enter your order id, email info and other details to track your order. Q. Can I save on power using this printer? A. The printer contains advanced energy conservation technology that reduces the power consumption when it is not in use. It is energy star certified thus save huge on electricity making it more environmentally friendly. Q. Why should we switch to remanufactured or compatible Samsung ML-1450 Toner Cartridges instead of using the new OEM cartridges? Help the Environment: Using remanufactured Samsung ML-1450 Toner Cartridges can save up to large quantity of plastic or metal from being dumped in a landfill. It conserves an average of 3 quarts of oil from being used to make a new cartridge. A. It might be possible that the drum in the cartridge has gone bad or the Samsung ML-1450 Toner Cartridges you’re using are low on ink. If shaking the toner doesn't help it means the cartridges need urgent replacement. Q. How efficient is your customer support? A. We aim to reply to all emails on time, either on the same working day or by next working day. It all depends on the time your query needs to get sorted out. For more urgent replies you can contact us on 048 3083322. Q. What are various modes of payment at Printer Ink Cartridges? A. The payment can be done using the Laser Card, American Express, MasterCard or Visa credit card, Maestro, Switch, or Delta debit card. For all the orders, payment is hosted by sage payments that guarantee the security of your card details. Q. Is this printer suitable for small business set-up? A. Yes, this printer is a low cost printer suitable for small office. Q. What is the weight and dimensions of the Samsung ML-1450 printer? A. Samsung ML-1450 printers weigh about 27.34lbs and measures about 14.3in x 16.1in x 11.6in (width x depth x height). Q. I have not used my printer for long time from now and the printouts obtained have missing colours. Is there anything I can do? A. If the printer is not been used for a long time, perform a head cleaning cycle using the software that was issued with your printer. It might be possible that the printhead in your printer or on your Samsung ML-1450 Toner Cartridge is probably blocked. To resolve this type to issue we recommend you to perform proper maintenance operation by regular cleaning the cartridge contacts or by printing 1-2 test pages in intervals if you do not use your printer frequently. Q. Why do you take delivery charges for delivering an item to nearby places? A. For fast delivery of the products, we work with our courier partners Fastway Couriers that aims at providing the products on time and thus take some charges for delivering an item. The charge for any item is €1.99 inc. VAT. which increases with weight. Q. Do I have to return the whole order if I want to return only the product from the list? A. No, you do not have to return the whole order if only one product needs replacement. You can contact us within 30 days of purchase and must return the item unused, in their original undamaged packaging and in a re-saleable condition. Q.The print is blank, I have just installed my new compatible Samsung ML-1450 Toner Cartridge. Is there a problem because of using the compatible ones? A. A blank printout comes when the sealing tape has not been removed from the new cartridges. Remove the seal from all the Samsung ML-1450 Toner Cartridges and get your prints. You might face the same issue even with the original brands. Q. What are the printer limitations that one should know before buying the product from the site? A. This monochrome printer is highly effective in printing quality printouts, but the only limitation is that the printing speed is slow when it comes in comparison to other products of the same range. Also, the appearance of the printer is not that effective. Q. Which operating systems are supported by this printer? A. This printer is Compatible with Windows 95, 98, 2000, Me, NT 4.0, and XP, Linux and Macintosh OS 8.6 and higher versions. Q. What assurance will I get, if I bought the product from your site? A. All our customers will get Quality assured - Fully tested products, 100% no quibble guarantee and full customer support on every product available on the site. Q. Will I get the ink supplies with the Samsung ML-1450 printer? A. Yes, you will get high-quality original Samsung ML-1450 Toner Cartridges along with the printer.